The other day I was sitting outside with my 4-year-old son, and I put some chapstick on his lips so they wouldn’t get sunburned. “Do my lips look beautiful, Mumma?” he asked. “Yes they do,” I replied. He immediately wiped the chapstick on his sleeve and said only girls are supposed to make their lips beautiful. He seemed concerned and upset, which made me concerned and upset. I was also angry at his preschool teacher Miss Suzie, who apparently taught him this nonsense. My son went on to describe a conversation in which Miss Suzie told him that only girls wear lipstick and make themselves beautiful with makeup. Boys are not supposed to do that, she said. 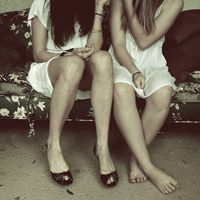 I told him that Miss Suzie was mistaken and that all people are different. I told him that if he wants to wear chapstick he can. I told him that if a girl doesn’t want to wear makeup she is still beautiful. I told him that it’s OK for a boy to wear makeup, if he wants to. I was so sad that a little bit of his innocence had been stolen. But, mostly, I was pissed off that anyone — especially a teacher — would take it upon herself to define gender roles for my son. Another day he threw a fit about a t-shirt I was dressing him in. I asked why he didn’t want to wear it (it used to be his favourite) and he said that pink is a “girl” colour. In the past, he would always say that pink and purple were his favourite colours. Now he thinks pink is off-limits. And he won’t even walk down the “girl aisle” — you know, the pink and purple princess explosion with a side of cooking and cleaning toys and baby dolls — at Target. He insists that it isn’t for boys. Never mind that one of his favourite toys at home is his kitchen set and that he likes to clean. It’s not just my son who is surrounded by people with ridiculous ideas of what boys should and shouldn’t do. A friend of mine recently told me that her 4-year-old son came home from a princess party with a crown and painted fingernails. He was delighted, and he wanted to keep the polish on and wear his crown to school the next day, so she let him. Because why not? Then, at drop-off, a father of another student in the class said, “First you let him paint his nails and now he’s wearing a crown? I’m beginning to wonder about you guys.” Wonder what, exactly? Luckily her son didn’t hear the father’s remarks. My friends’ little girls are supported if they wish to play with cars. They’re allowed to play superhero without being told “superheroes are for boys,” and rightfully so. I love that there is a movement to allow girls to do things that in the past were traditionally assigned to boys. They can wear blue, black, brown, red, pink, or purple. They are encouraged to play with what they like, whether that’s sports, dolls, or matchbox cars. I’m sure every little girl isn’t encouraged in this way, but I think it is getting more common. Why can’t we give the same allowance to our boys? 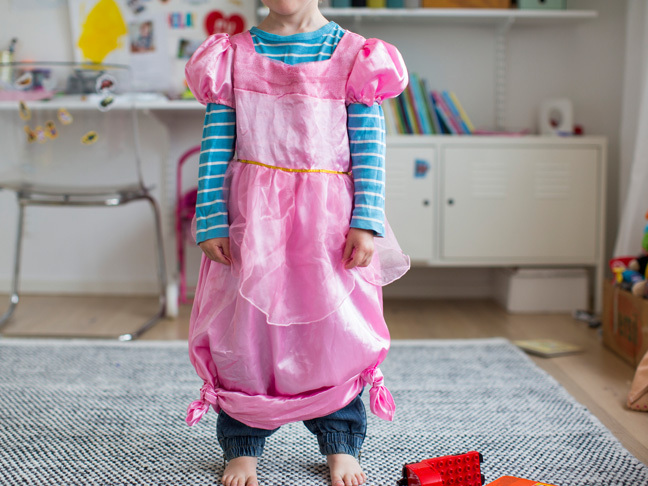 Why do we laugh if a boy wants to wear a princess dress or a crown? Our kids are going to spend the rest of their lives either being stuck within “societal norms” or pushing the boundaries because they don’t feel like they fit. Can’t we just let them be little and have fun while they can? Can’t we just make all toy aisles in stores a rainbow of colours and let the kids have a free-for-all? I read an article by a dad who supported his young son wearing dresses, and it made me cry. It also reminded me of the type of parent I want to be for both of my sons. Because your kids are born who they are. Telling them they can’t wear chapstick or pink will not make them more of a “boy” or teach them how to be a good man. But letting them know they are loved and supported for who they are will. I know I’ll let my sons play what they want, wear what they want, and chose whatever colours they want for as long as I can. I’ll be sure to let them know that some close-minded people think some things are just for boys or just for girls, but that they are wrong and we should just ignore them and do what makes us happy. If playing with trucks makes my boys happy, then great. But, if they’d rather wear dresses or pretend to be mums, that’s fine too. And if someone has a problem with that, too bad.